Stay all the day in the Park!! 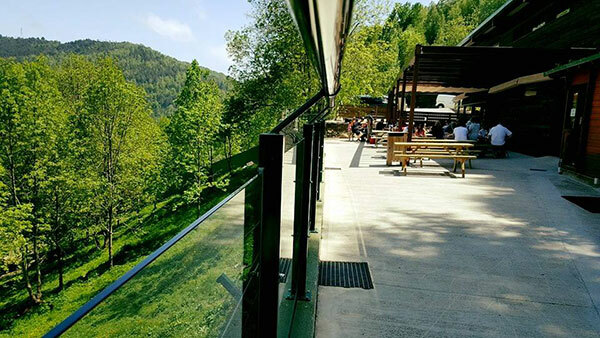 Molló Parc has two picnic areas, in the open air, where visitors can rest, eat and spend some time resting while visiting the park. In both areas there is a drinks and snacks machine available throughout the year (they only accept coins), a bar / cafeteria service where you can buy: pizzas, sandwiches, hamburgers, ice creams … open according to the calendar indicated below. In both areas there is BEVERAGES AND SNACKS MACHINE that work all year round. Food is allowed but in the picnic area of ​​the river, only food stored in backpacks is allowed. 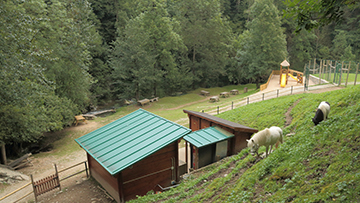 This area has views of the bear enclosure and is where the inflatable Molló Parc is located. January, February and March, open on Saturdays, Sundays, holidays and bridges only with the possibility of acquiring coffees and drinks (not meals). Easter Week, open 4 days, from Friday to Monday (drinks, coffee and food). April, May and June, open Saturdays, Sundays, holidays and bridges (drinks, coffees and food). July, August, September open every day (drinks, coffees and food).From October to December (included) open Saturdays, Sundays, holidays and bridges. If you want sandwiches, you must order at least 2 hours in advance at the same bar, but it will take a minimum of 20 minutes to make them. Weekends are not made. Easter Week, open 4 days, from Friday to Monday. July, August and until September 13 open every day (from 11:00 a.m. to 5:30 p.m.). May, June and September 14 until October 15: Open Saturdays, Sundays, holidays and bridges. The management reserves the possibility of not opening this bar according to the weather. In this bar / cafeteria you can not pay with a credit card.